The MiGCSA is dedicated to providing value to our members through programs and services that enhance and promote our profession. Over the last three to four years the Michigan Department of Agriculture and Rural Development (MDARD) Pesticide and Plant Pest Management Division (PPPMD) have been increasing their focus on the Golf Industry here in Michigan. Many members have noted a drop in visit from these inspectors across the entire state this summer. This started heating up in 2015 and we did publish letters from the MDARD and PPPMD folks in the magazine, online and in this blog, but based on some recent reports from MiGCSA Members I thought going over some of the facts again would be a good idea. The Pesticide and Plant Pest Management Division (PPPMD) is responsible for the implementation of programs and enforcement of laws concerning agricultural products, export commodities, pesticide sale and use, pest management and groundwater protection. Here is a quote from them in 2015 on why their focus on golf has emerged: “MDARD has made a renewed effort to conduct inspections at golf courses in the last 3 years. MDARD began by identifying golf courses in Michigan that did not have a certified applicator as an employee in MDARD’s records. Of the approximate 900 golf courses in Michigan MDARD identified 322 golf courses who did not appear to employ a certified pesticide applicator. Over the past 3 years, 113 inspections have taken place with a high rate of non-compliance with MDARD’s regulations. 81 golf courses or 72% of the 113 inspected golf courses received an immediate stop order with enforcement action taken after the inspection was completed.” The goal of the PPPMD inspectors is not to fine but to help get compliance to protest our groundwater. I have many, many personal meetings with the PPPMD and MDARD and it is a very common theme among all of them. Thankfully we here in Michigan have tools available to us to make sure your facility is following the rules and regulations. The Michigan Turfgrass Environmental Stewardship Program (MTESP) has been around as long as these regulations that came about in the late 90's. Many MiGCSA Members probably still have their MTESP binders in their offices to this day. When I took over the MTESP in 2013 we went through a full digital conversion of this booklet along with a review from the MDARD and PPPMD folks. It is an easy to navigate online survey style module based program that is FREE. The funding for this program comes from the Michigan Water Stewardship Program. The website www.MTESP.org is always improving as is the program. The individual information is only accessed by myself and John Johnson the MTESP Stewardship Specialist and not shared with any government regulators beyond overall website traffic and statistics to show use and viability. So if you're not already go get an account set up at MTESP.org and identify where you may be lacking or in violation, ignorance is not an acceptable response if you are inspected. Know where you stand, inform your ownership or management, be proactive not reactive. The tools are free and easy to use. As always let me know if you have any questions at adamikamas@migcsa.org or adam@mtesp.org. As we here at the MiGCSA sit down to pan another year and we look forward to the many meetings during the winter months we rely on our Board and Committees to help plan and execute these many events. At every meeting there is always a Board or Committee Member who stands up in front of the group and thanks our partners, or introduces a speaker or just to give an update. I know from experience as a new young Superintendent back in 2004 that I wondered why is this person or that one standing up? How did they get there? If you have ever had that thought too then I am about to spill the beans on how to get to be someone who stands up, ready... here is what you do: Stand Up! Maybe not physically but in a more metaphorical way, send an email to a committee chair here is a list: http://www.migcsa.org/migcsa-committees-35/ or a general email to info@migcsa.org. If you see ways the MiGCSA can improve, get on the best committee to help. If you have a passion for something specific get with that chairman. I promise that is all it takes, no one will be turned away if they make an effort to help. More often than not the best committee members become Board Members who then become Officers and are able to have a very unique experience along the way. A bond with your fellow committee members from all over the state that last for an entire career, interactions nationally at the Chapter Leaders Symposium, National Golf Day and GCSAA Delegates Meeting. Along with local interaction with the Michigan Golf alliance (PGA, GAM, MGCOA & MCMA) the Michigan Golf Hall of Fame and all of the awesome opportunities to help to provide value to our members through programs and services that enhance and promote our profession. So if you ever thought about standing up do it! I promise no one who has stood up or is currently would take any of it back. It is not an exclusive club, it is open and welcoming to all members and every budget. There is no time like the present! As the irrigation is blown out and those final sprays are upon us it is the time of year that most members start the winter education planning. The 2018 Michigan Turfgrass Conference is January 3rd to the 5th this year. I have had a lot of feedback on these dates being very challenging with the New Year so close. First off this conference is not planned or produced by the MiGCSA, this event is put together by the Michigan Turfgrass Foundation (MTF) and we support them in any way possible. I attend the MTF Meetings and they are very aware of the challenge these dates propose. This was a result of the mid January dates not being reserved far enough out a few years ago which left only this time frame for a few years, the hope is to get it pushed to later in the month as soon as possible. The timeline is tight but the opportunities are endless. Added bonus is that all of the proceeds from this conference go to support the turf research we all rely on from MSU. Get registered today, I hope to see you all in East Lansing! Why are the Fundraisers so much more this year!?!? With registration opening for the Western Golf Day Fundraiser the fall golf season is in full swing for the MiGCSA. We are heading to beautiful Muskegon C.C. on 9/18 and the Big Event is on 10/9 at newly renovated Bloomfield Hills C.C. these both follow the ever successful Arcadia Bluffs Fundraiser back in June. However the cost of $155 has made for a few double takes. These events have been $125 per person since before the MiGCSA was formed so a jump of this amount is noticeable. This was decided by the MiGCSA Board back in March of 2017 and the following letter was sent out to all members on 3/24. I think this covers the reasoning very well so I will re post it here for clarification. For over 50 years fundraisers have taken place in Michigan to support Turf Research and provide scholarships for turf students and children of MiGCSA Members. During those years, there have been many host sites around our great state. Since inception of the MiGCSA in 2008 and even before the merger the cost of these events has remained steady at $125 per participant. However, the cost of hosting these events at these great golf venues has steadily increased. Much like a golf course budget you cannot produce the same results today with the same budget as 2008 even though many MiGCSA Members are asked to do just that. It is because of this that the Board of Directors approved an increase of $30 to the cost of all Fundraisers starting in 2017. This was not done without thorough discussion, debate and thought. The goal of these events is to raise money, money that goes directly back to the industry. The majority of these funds go to the Michigan Turfgrass Foundation to fund the best turf research program in the world right here in our backyard. The proceeds also help fund Member Dependent Heritage and Student Scholarships, Wee One Foundation and the EIFG. As costs have continued to rise over the last eight years the income for these events has been stagnant, as a result the donations to the MTF have steadily declined. Thankfully participation has been and remains strong as do sponsorships which has allowed the MiGCSA to crest $100,000 in donations to the MTF this year. However, this is not a sustainable model for the future. It is important to remember these events directly benefit you, our members we represent. We welcome feedback on this decision and hope you understand why it was made. 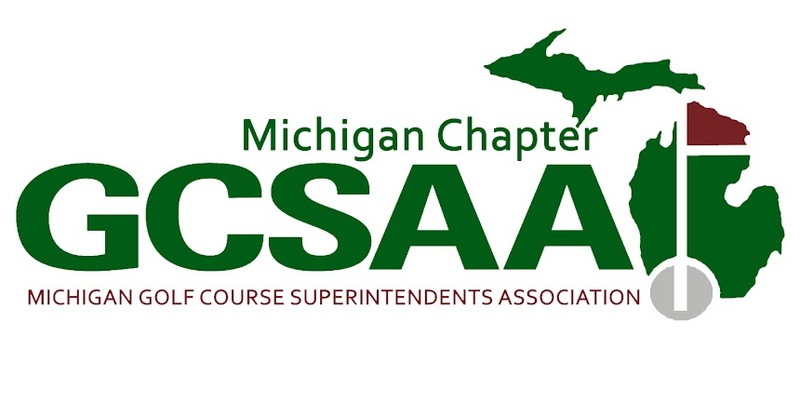 Thank you for your support of the MiGCSA and the golf industry in Michigan. On July 7th the MiGCSA launched a new fundraiser online selling some really cool T shirts. This was an idea that was formed from an annual meeting with my fellow Great Lakes Chapter Executives in Columbus Ohio in June. The OTF did a similar fundraiser and it was very successful so we decided to do our own. 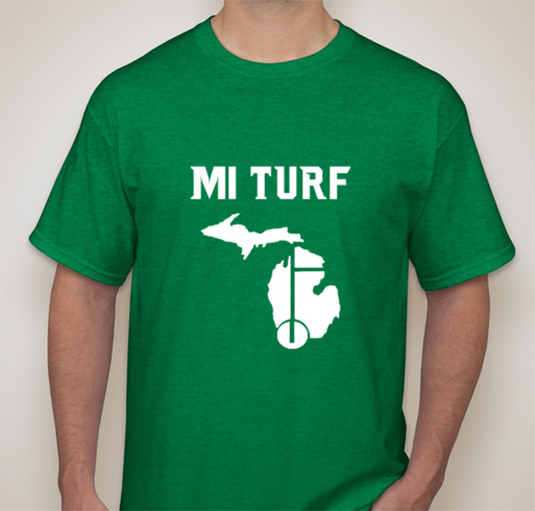 The idea for the actual shirt came from Adam Garr our Syngenta rep who has been using a great hashtag #MITuf when discussing issues on turf this summer. The combination with our logo was a natural fit. The two week time frame sold 180 shirts and raised $3,820! Thank you to everyone who supported this fundraiser, it was an amazing show of support and community. It is raining here at MiGCSA HQ just north of Grand Rapids, not quite the warm spring rain that is usually coming around this time of year but it is a big all day spring rain none the less. It is that slow all day soaker that reminds you the real spring is here. Another sure sign of spring is my Twitter and Facebook feeds are packed with photos of greens mowers out making that first cut, one of my favorite days of the year when I was a Superintendent. Everyone knows it is Go Time. It all happens fast, all of the sudden your back on the sprayer, the first shotgun start and the double mow and roll days are upon you. Here in Michigan that is usually broken up by some brutal cold weather and sometimes snow as winter tries to hang on longer than anyone wants it to, but we all know it is Go Time. So this is a great time of year to make sure you have some plans to do more than the day to day operations on the golf course. Of course these are very important to you and your job security, but I caution you on thinking that is the only thing you need to do to be successful. Your Chapter has many opportunities for you to meet and interact with fellow members all season, from the 24th of April to the 2nd of October. Right now make the plans to attend at least one or two of these meetings. I would also encourage you to sign up as a single, I know radical right? But when you do that I will make sure you are paired with someone you will value meeting at the end of the day. Yes golfing with your "group" is fun, and I am not saying you should drop those guys, but maybe go to a meeting in another area of the state, as a single or ride with someone and get paired up. Or even better grab that guy down the road who you know is not a member and invite them to come with you, expose them to the MiGCSA and our members, think about how much that would mean to them. Grow your network, meet some new people who are just like you. North, South East or West we are all Golf Course Superintendents. So before Go Time becomes I can't go time make your plans to utilize these opportunities, you will never know what your missing if you always miss it! This article was spurned by a post on the Facebook page started by Gary Grigg called Golf Course Maintenance. If you are not a member it is a great group and is really a forum for many things. The topic that lead me to write this was on the GCSAA new classification system where class SM Members will go back to a classification of B. This was voted on at the 2016 GCSAA Annual Meeting after discussion by the chapter delegates and the Board of the MiGCSA did approve it as well. There was a complaint on this page about the reclassification as feeling like a second-class citizen. It lead to many more comments about the GCSAA and the feeling that the membership dues are not worth it, things about the local chapter has my back but not he National or just flat out it is a waste of money what do they do for me? Now this is not the first time I have heard this, and personally there was a time when perhaps I would have not disagreed with it. If you look at GCSAA or MiGCSA Membership as a service, then it appears to be a terrible value. $375 for a GCSAA Membership and another $100 for the MiGCSA and all you get are a few magazines you don’t usually have time to read. When that is the mind set, I cannot blame someone for not seeing the value. However, if that is your mindset I am not sure you understand how this all works. The GCSAA and MiGCSA are not a direct service in the traditional sense. These groups are an opportunity and can be as large of an opportunity as you can make of them. If you sit back and wait for the GCSAA & MiGCSA do things for you it will not work, it is not supposed to work that way. It is like buying a new sprayer parking it in the barn and wondering why you have disease ridden turf, you must use it for it to work! Anything you need or could want is at your fingertips, but you must, under your own power move them. When I first started this job, I struggled with trying to come up with the “elevator pitch” to explain why the MiGCSA is important for members. I started listing all the things we do behind the scenes like foster relationships with the State and Local Governments, provide networking and educational opportunities, produce an industry leading magazine and a massive communication network and so on down the line into the minutia of the daily operations. But as I struggled with this I was turned on to a Ted Talk by Simon Sinek on the idea that people do not believe in what you do they believe in why you do it. This resonated with me and has changed my elevator speech completely. The MiGCSA or GCSAA for that matter is not about doing things for you, even though they both do, a lot. They are about giving you the opportunity to be part of us, not them, just us. 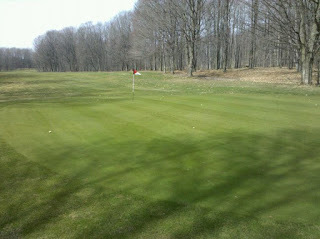 We are all Michigan Golf Course Superintendents members or not, it is what we do. Why do we do it? For the giant pay checks or the glory and appreciation? It is because we are passionate about our profession. As a group of people who are passionate about our profession we are unstoppable, when we all believe in why we do it together, we are unstoppable, when we utilize the opportunities by getting involved to whatever level you would like, we are unstoppable. Not us and them, just us. When the GCSAA does well we all do well, when the MiGCSA does well we all do well. It is not they do well, we are they. So, the next time you wonder about paying your dues to either group please think of it not as a service like your cable bill, but as an investment in all of us which absolutely includes YOU! Scott Schulte and Juniors leading the way on the Pratice Tee!! !